As a general rule of thumb I like books written by Kim Baldwin, however I found that I didn't particularly like this one. I suspects it's because I really didn't like either of the main characters. I disliked the way Pasha was portrayed and felt that the way her "gift" was handled struck me as cartoonish and unfortunately that feeling never went away. On the other hand, I hated the Emery character almost immediately but as the story progressed she started to become a little less 1 dimenstional.Ultimately, for me it was just an ok story. Nice little romance, bringing together almost all of the previous characters from the Author's previous Alaskan novels.While the romance is front and centre with this book, I did find myself wishing for a more visceral experience with the danger and uncertainty ramped up slightly higher. Much as I love this author, I do wish that there was more Cari Hunter type blood and guts. Hey, that's just me! I really wanted to read something new the other night.I looked through my ever-growing pile of “to read” novels and my eyes lingered on the spine of a book called “High Impact” – I got a little tingle and decided that’s what I would read.After reading “High Impact,” it felt it rather appropriate that “a little tingle” was the impetus for choosing this novel.I’ve always loved Baldwin’s writing. I was first introduced to her via Xena Fan Fiction. It was exciting to learn a bit later on that she’d gotten published. I began to devour her novels! In fact, “Force of Nature” is one of those books that I’ve read over and over and over. When I’d told Baldwin how many times I’d read it, I think she mentioned to me that I’d probably read it more times than she had. It’s definitely one of my “comfort” books. I can’t seem to get enough of it. Sometimes I’ll pick it up and just read sections from it. It’s not necessary for me to read it from cover to cover anymore – though I often do. Those snippets of reading will often satisfy my need for some good romance.When I began reading “High Impact,” I knew within the first chapter that Baldwin would not let me down.Emery Lawson is an admitted “adrenaline junkie.” A near-death experience causes Emery to re-evaluate her life and determine that she needs to stop saving for the day she’d start living her life…and actually start living it.Pasha Dunn is a guide with an adventure outfitter in Alaska. An innate “calling” has led her to this remote landscape. She just knows that it’s here, in the Alaskan wilderness, that important, life-changing things will happen for her.When Emery and Pasha meet, the attraction is undeniable. Pasha knows that Emery is “the one” for her. Emery, believing herself incapable of love, doesn’t understand the depth of the attraction. Soon, however, Emery and Pasha will be tested when they are thrust into a fight to survive.Here is what I appreciate most about all of Baldwin’s writing: she doesn’t get to the point.Wait!That’s a compliment! Really!Let me explain.I think we all know just how easy it would be to just cut to the chase – introduce the main characters, demonstrate that they have the hots for each other, put them in a life-threatening situation, and watch the romance blossom!Yeah, not so much with Baldwin’s writing.Instead, Baldwin gives us the time to get to know these characters – and to let the characters get to know each other. A good 2/3 of the book lets us into their lives. As Emery spends more time in Bettles and becomes familiar with the town and its citizens, we’re allowed to experience the wonder she has for her surroundings and the pleasure she finds in making new friends. We get insights into the hopes and fears that Pasha and Emery experience as they get to know each other and learn about their “connection” to each other.Baldwin introduces us to a bevy of secondary characters who, rather than being superfluous page fillers, bring depth to the story. They don’t have their own stories here – there are no real “sub-plots” – but they definitely contribute to the main plot line. They allow us additional insight into how the relationship between Pasha and Emery develops; they provide needed and interesting exposition that bridges any gaps the readers may have about Alaska, about camping, about living in this remote land. They serve as narrators, without actually narrating. I like that!As with just about everything I’ve read of Baldwin’s, the setting is always cast as the third main character. Again, she takes the time to allow Alaska to become a major player in the novel. This is not a story that can be told in any setting. The setting is what makes the story work. This would have been a completely different novel had it taken place in the Badlands or the Appalachians.I think “Force of Nature” will always be my favorite Baldwin novel. But that has everything to do with it being my first Baldwin novel. I always hold a special place for “firsts” in my life. But, I gotta say, “High Impact” is right up there.Yes, I’ll be reading it again. Excellent!I can't think of a better word. This book has everything. Beautifully described landscapes, humour by the bucket load, adventure, romance and this amazingly strong urge to visit Alaska. Kim Baldwin skills as an author are amazing. She has the ability to share her characters with you as though you know them personally. You join them on their journeys and witness all their ups and downs along the way. What's also special is you feel like part of a community because characters from her other books are there too. It's an awesome and interesting read, one I'm sure you will love. Enjoy! I didn't like this quite as much as her other two Alaska books, but it's very good. I enjoyed seeing Chad, Megan, Bryson and Karla come back, and I liked going back to Bettles. I think Pasha's extra sense just didn't do it for me because it felt out of place, but that wasn't enough to take too much away from it for me. Now I just hope Geneva eventually gets her own story. I absolutely loved this story and visualizing the scenery made me want to keep reading (losing sleep on the journey). This is my first Kim Baldwin book but I will definitely getting more of her in my collection. 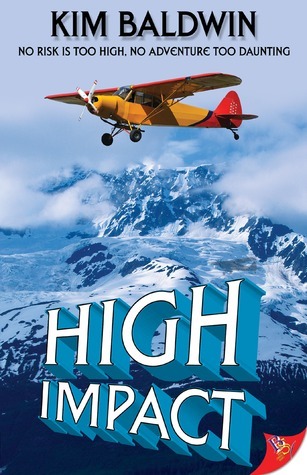 High impactI chose the book as I've always wanted to visit Alaska. The story was good, but the description of places was great. I could envision these places and it makes me want to go to Alaska even more. Lame story that comes off both gimmicky-one character with "powers"- and repetitive- same author uses similar "in peril" plot device to quickly bond the lead characters. Mindless, forgettable storyline with a rushed ending. High impactGreat story, amazing characters, storyline showed a tremendous amount of strength and love throughout. I felt as if I could really see Alaska! Alaska here we comeAn Alaskan adventure for lesbians. The setting is possibly the most important character in this book which makes for an interesting read. I enjoyed the writing style and the fact that it was set in Alaska. It was very enjoyable to read. This was okBaldwin has a nice plot to this story but I didn't ever connect with the characters. a decent read but not a favorite. Really enjoyed her other Alaska books. This one did not work for me. Pasha who has premonitions and feels when Emery arrives in Alaska is just to unrealistic. A very Meh story. Excellent loved it, Ms. Baldwin does it again!